(Nanowerk News) A small rectangle of pink glass, about the size of a postage stamp, sits on Professor Amy Shen's desk. Despite its outwardly modest appearance, this little glass slide has the potential to revolutionize a wide range of processes, from monitoring food quality to diagnosing diseases. The slide is made of a 'nanoplasmonic' material -- its surface is coated in millions of gold nanostructures, each just a few billionths of a square meter in size. 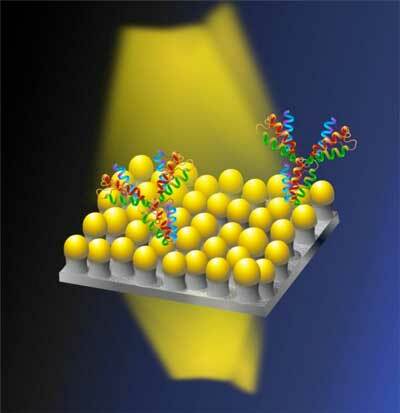 Plasmonic materials absorb and scatter light in interesting ways, giving them unique sensing properties. Nanoplasmonic materials have attracted the attention of biologists, chemists, physicists and material scientists, with possible uses in a diverse array of fields, such as biosensing, data storage, light generation and solar cells. "One of the major goals of nanoplasmonics is to search for better ways to monitor processes in living cells in real time," says Prof. Shen. Capturing such information can reveal clues about cell behavior, but creating nanomaterials on which cells can survive for long periods of time yet don't interfere with the cellular processes being measured is a challenge, she explains. One of the team's new biosensors is made from a nanoplasmonic material that is able to accommodate a large number of cells on a single substrate and to monitor cell proliferation, a fundamental process involving cell growth and division, in real time. Seeing this process in action can reveal important insights into the health and functions of cells and tissues. Researchers in OIST's Micro/Bio/Nanofluidics Unit described the sensor in a study recently published in the journal Advanced Biosystems ("Large-Scale Nanophotonic Structures for Long-Term Monitoring of Cell Proliferation"). The most attractive feature of the material is that it allows cells to survive over long time periods. "Usually, when you put live cells on a nanomaterial, that material is toxic and it kills the cells," says Dr. Nikhil Bhalla, a postdoctoral researcher at OIST and first author of the paper. "However, using our material, cells survived for over seven days." 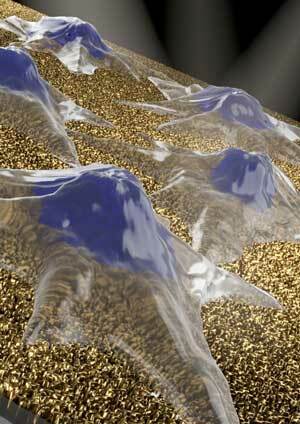 The nanoplasmonic material is also highly sensitive: It can detect an increase in cells as small as 16 in 1000 cells. "Normally, you have to add labels, such as dyes or molecules, to cells, to be able to count dividing cells," says Dr. Bhalla. "However, with our method, the nanomushrooms can sense them directly." This work builds on a new method, developed by scientists at the Micro/Bio/Nanofluidics Unit at OIST, for fabricating nanomushroom biosensors. The technique was published in the journal ACS Applied Materials and Interfaces in December 2017 ("Plasma-Assisted Large-Scale Nanoassembly of Metal?Insulator Bioplasmonic Mushrooms"). "Our technique is like taking a stamp, covering it with ink made from biological molecules, and printing onto the nanoplasmonic slide," says Shivani Sathish, a PhD student at OIST and co-author of the paper. The biological molecules increase the sensitivity of the material, meaning it can sense extremely low concentrations of substances, such as antibodies, and thus potentially detect diseases in their earliest stages. "Using our method, it is possible to create a highly sensitive biosensor that can detect even single molecules," says Dr. Bhalla, first author of the paper. Plasmonic and nanoplasmonic sensors offer important tools for many fields, from electronics to food production to medicine. For example, in December 2017, second year Ph.D student Ainash Garifullina from the Unit developed a new plasmonic material for monitoring the quality of food products during the manufacturing process. The results were published in the journal Analytical Methods ("Probing specific gravity in real-time with graphene oxide plasmonics ").